So, you’ve lost your car title. It may feel like the end of the world, but we assure you, it CAN be replaced. 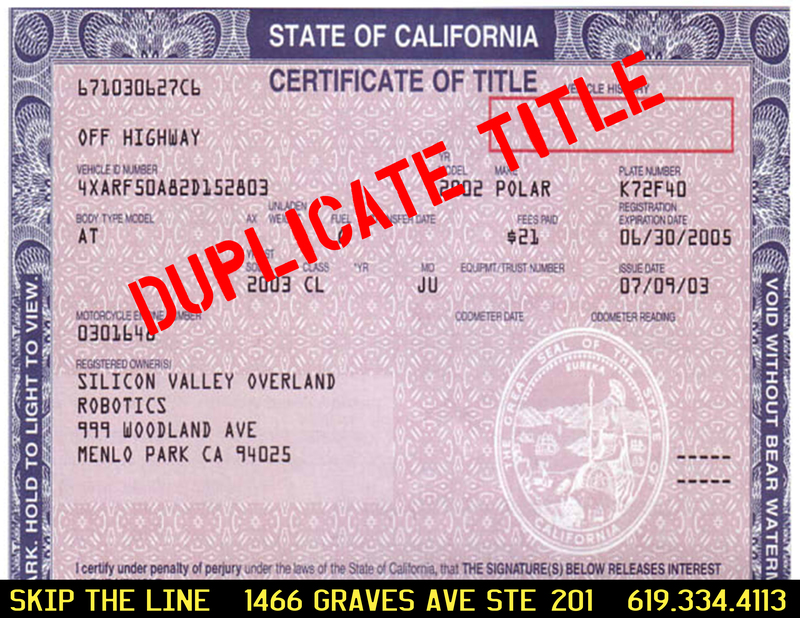 At Skip The Line Vehicle Registration, we can get you a duplicate title in minutes! Your vehicle’s title is a very important document and it’s important to have it for any kind of buy or sell action on the vehicle. There are many instances in which your title was not lost. We have listed a few examples of reasons you might think your title is lost or missing. 1. The Vehicle Was Financed and The Legal Owner Has The Title. 2. Your Vehicle Was Titled In A Different State. If your vehicle received a title in a different state, but you registered the same vehicle in California, it is known as Non-Resident (Goldenrod) Registration and you must contact the original state to receive your title. 3. Trailers are not issued titles unless specifically requested and paid for. 4. The Transaction Is In An RDF (unfinished) Status. 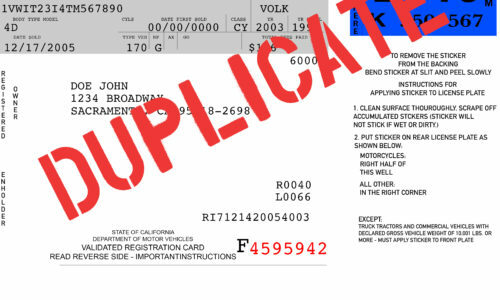 When your vehicle was titled, if there was a needed document missing or your vehicle failed a smog check, it will have been processed as an unfinished transaction, or RDF. You will need to check the paperwork you received from the California DMV when you started the unfinished title transfer. How To Apply For A Duplicate Title? If you have read the above scenarios and none of them apply, then it is extremely likely that you really have misplaced your car title. You now need to apply for a duplicate via the DMV or Skip The Line. First, you must check the box that says “Duplicate Title” at the top. 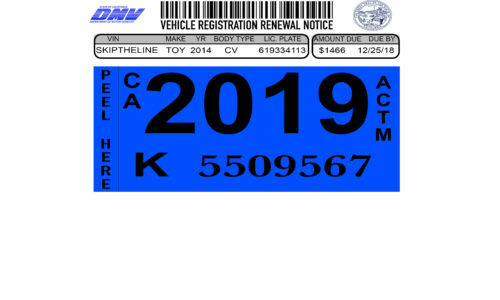 Below that, fill in your vehicle’s license plate, VIN number (located on the bottom corner of the windshield on the driver’s side), year, and make. All of this can be found on your registration card. This section is required and must be completely filled out. This area covers the registered owner’s information and must be up to date. If your mailing address isdifferent than your physical residence, do not forget to fill out the correct mailing address in order to receive your duplicate title. This section is not required unless the vehicle is under a lienholder. In that case, you must fill out their information. This also means that the company should have a physical or electronic copy of the title and you can request it from them. If not, continue to apply for a duplicate. 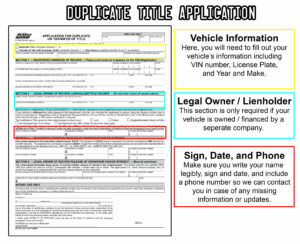 Check the box that describes the events leading up to the missing vehicle title. Then, sign, date, and include your phone number in case anyone needs to contact you for any missing information. These sections are only required if you are releasing ownership of the vehicle. To submit and process your application, you have 3 options. 1. Go to the DMV and wait in line for many, many hours and pay the duplicate title fees. 2. Send your application by mail with an attached check for fees and wait many, many weeks for them to process your application and then wait many, many more weeks for them to send you your new title. 3. Come to Skip The Line and we will help you apply for your duplicate title in minutes and we will process everything for you, getting your title to you faster than ever. We can do all of this for a grand total of $60, including your duplicate title fees. If you are looking to sell the vehicle (Sections 4-8), we can do it all for you with our licensed and highly trained staff. Call (619)334-4113 or stop in at 1466 Graves Ave. Ste 201 to Skip The Line and get amazing, fast service and leave with a smile! Please note: Skip The Line Vehicle Registration is not owned or operated by any government agency. Skip The Line Vehicle Registration is not the California DMV. We process the simplest transactions to the most complex, in a matter of minutes. Skip The Line Vehicle offers same day service on most vehicle registration transactions. The best part of all, is that our service is done with a smile! Skip The Line Vehicle Registration accepts all major credit cards. Please inquire about our IMMEDIATE INSURANCE SUSPENSION PROGRAM. If your DMV registration has been suspended due to lack of insurance give us a call! We can process your registration over the phone. Skip The Line Vehicle Registration has the ability to lift your registration suspension immediately.We can have you back on the roads in no time. Copyright © 2018 Skip the lines ! - All Rights Reserved.